Probably for the first time in the history of global campaign for gender pay equality, the Nigeria Football Federation has distinguished itself as an equal opportunity organisation, this is a welcomed development; however, the NFF would do well if players and officials pay structure is aligned to the same institutional equality ethos. CESSFsportify will continue its campaign and support for upcoming talents and their development in the hope that we can retain our best sporting capacities and remain a talent hub for professional football export. The lack of support and "disrespectful attitude" to players over the years may have reached a crescendo with the latest Super Falcon public outburst. Former Super Falcons Striker and Nigeria football Legend, Mercy Akide-Udoh who suggested her Children “will never play for Nigeria” if the poor treatment of players persists in the Football Federation highlights a real and present threat to Nigeria football glory in years to come; a nation of football. African women's champions Nigeria in fight for 'welfare'. "We are not leaving this hotel and we have not been told exactly when we are going to get paid," the player, who insisted on anonymity, told BBC Sport. "The plan is to stay here until we all receive the money because the moment we leave there will be no opportunity to get it again." The Super Falcons' protest began on Tuesday. Siasia, the most decorated African football coach at the Olympics having also won a silver medal in Beijing in 2008, claims to have gone unpaid for five months by his employers - the Nigeria Football Federation (NFF). Samson Siasia, who coached Nigeria's men's football team to a bronze medal at the Rio Olympics, is quitting the game in his country because of what he describes as "a disrespectful system". Nigeria also had a troubled build-up to their quarter-final against Denmark after the players boycotted a training session in a dispute over pay. "I have fulfilled my obligations as a citizen, footballer and coach; right now, I do not want to be involved in the Nigerian football system anymore," said Siasia. "Players had to embark on a strike to be heard, then the boys kept a good spirit to win an incredible medal. "It's sad that after all we went through to get to Brazil and end up winning a bronze medal, the players, coaching and backroom staff never received a 'thank you' in appreciation despite a turbulent time at the Olympics" Siasia added. 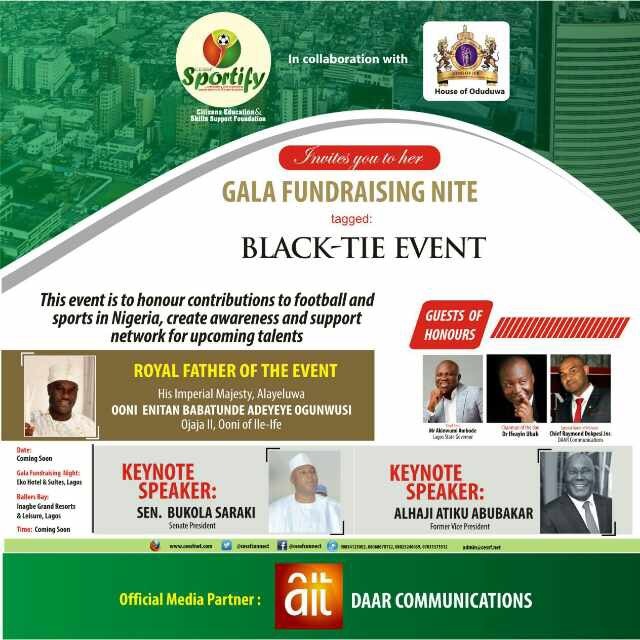 It is noteworthy at this point to appreciate his imperial majesty Oba Adeyeye Ogunwusi Ojaja II Ooni of Ife for his passion and support for CESSFsportify fundraising gala night and his total commitment to youth empowerment through sport. We urge well-meaning individuals and corporate responsible organisations to join hands with us to support our sport icons and future champions.